Saturday preview hours are from 9:00 to 3:00. 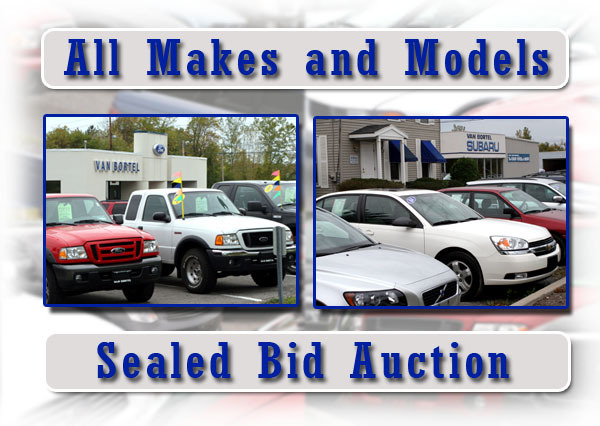 At Van Bortel Auction, vehicles, currently 2009 and older, receive an abbreviated check-over process and are sold AS IS. This check-over includes only the engine, transmission, and frame. If the engine and transmission operate acceptably for their age and/or mileage, we will report that as Engine Ok and/or Transmission Ok. If we find that a frame has a corrosion issue that would prevent it from passing NY state inspection we will report that as Frame Rot. We do our best to facilitate personal inspection of these vehicles and we ask that you please do not bid without actually seeing and driving them. Please note: While we do our best to acquire all available keys during the trade-in transaction we are not always successful, therefore not all Auction vehicles will come with an extra key. Our fax number is 585-924-8723. Located at the corner of Route 96 & Route 251. When: Scheduled auctions start at 9AM and end at 4PM.